I have always loved color and thought in terms of color. My career as a graphic designer has been satisfying but I have always wanted to just paint. Happily I found a studio at Holliston Mill and now paint full time. Oil paint is my medium because I love the texture and the rich color possibilities. 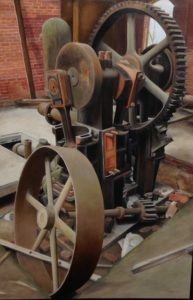 I love painting things that are imperfect or once functional but now are obsolete like broken shells, old rusted pumps, derelict buildings.